WordPress SEO vs All in One SEO Pack: Which Is The Best SEO Plugin? The core version of WordPress offers basic SEO functionality such as pretty permalink structures, the ability to change the post slug and the ability to change your website title and description. Our themes come with some great SEO Settings in ePanel, however, we also made sure that our themes are compatible with some of the most popular WordPress SEO plugins as well. Two of the most common plugins used on WordPress websites are All in One SEO Pack (seventeen million downloads) and WordPress SEO by Yoast (nine million downloads). Today I would like to give you an insight into how these plugins work and what they can do for your website. Specifically, I would like to show you how these plugins handle search engine optimization differently. WordPress SEO offers much more functionality than All in One SEO Pack. This becomes apparent when you compare the main menu for each plugin. WordPress SEO splits settings into twelve pages. It is worth noting that the plugins do handle menus a little differently. All in One SEO Pack places the majority of its settings in its General Settings page, whereas WordPress SEO separates everything into different pages and tabs. 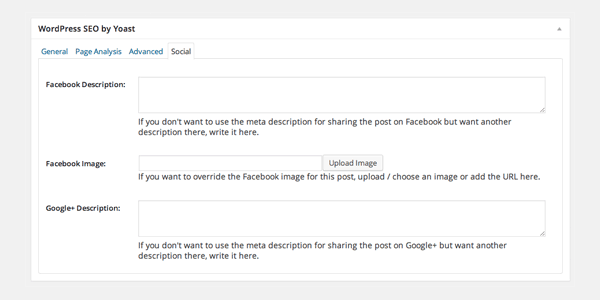 Both plugins allow you to configure titles and meta information for your posts, pages, and custom post types. WordPress SEO splits this section into five different parts. The general tab lets you force rewriting of titles and add additional meta tags to your page such as meta, noodp (DMOZ), and noydir (Yahoo). It will pull your website title and description from your main WordPress settings area; however these can be modified using the home tab. Less important meta information can be enabled if you wish. The plugin lets you change the default output for page titles and descriptions. You can also disable Noindex, rel=”author”, snippet dates, and the WordPress SEO meta box underneath posts and pages. You can customize all of this information for posts, pages, media, categories, author archives, and more (fields are split between the post types ,taxonomies and other tabs). The settings area is where you define the default settings for titles and descriptions. 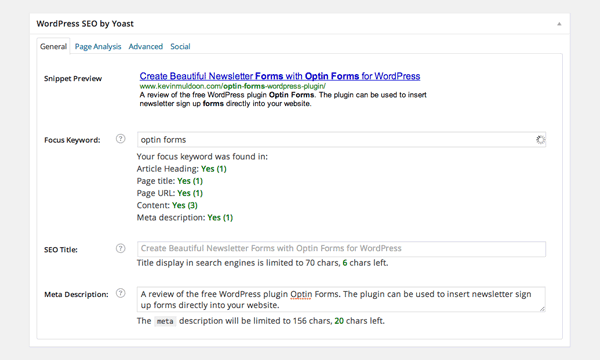 The plugin adds a “WordPress SEO by Yoast” box underneath the post editor for all your posts, pages, and post types. The general tab is where you define your focus keyword, SEO title, and meta description. The preview shows in real time what your article will look like on a search engine results page. Define your SEO title and meta description. The Page Analysis tab gives you feedback on how your article performs against suggested search engine optimization settings. For example, it will warn you if you do not have <h2> tags in your header or if your article is too short. Page Analysis helps you construct an article that is search engine friendly. The advanced tab contains multiple robots options such as excluding the post from indexing or excluding from directories like DMOZ and Yahoo. Authorship and sitemap settings for the article can also be controlled here. You can block search engines from indexing your article. The final tab allows you to define the Facebook description, Facebook image, and Google+ description. If these fields are not completed, the plugin will use the meta description you defined in the general tab. Most website owners simply use the meta description for social media services they entered in the general tab. Whereas WordPress SEO splits title settings into five tabs, All in One SEO Pack places all settings on one page. From this page you can configure your home page meta information, exclude pages, verify Webmaster Tools, connect with Google Analytics, and more. 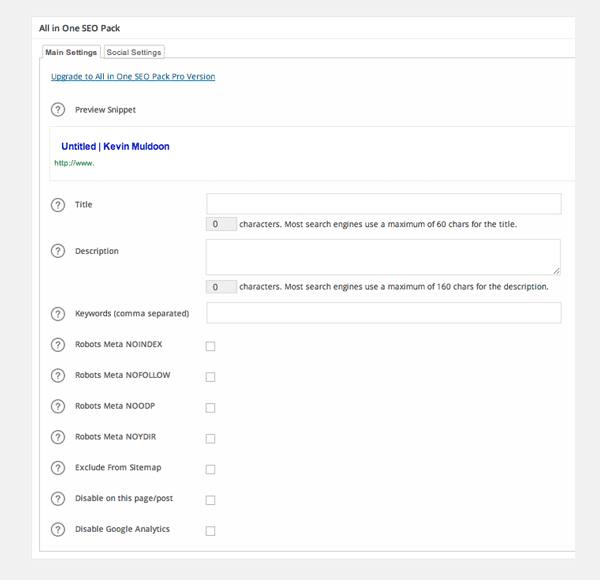 Ten different settings options can be found on the main All in One SEO Pack options page. The default title settings for all post types and taxonomies are displayed in the one area. I found this to be a quick and practical way of quickly adjusting title settings. Title Settings can be adjusted easily in one area. 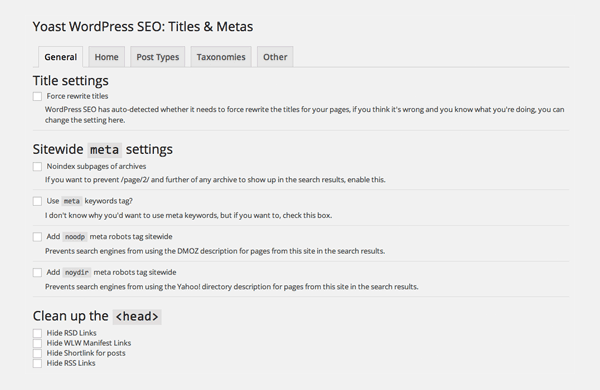 All in One SEO Pack also displays a meta box underneath the post editor. It works in a similar way to WordPress SEO. At the top of the main settings tab are fields for defining the article title, description, and main keywords. Various settings are underneath such as excluding the page from being indexed, excluding it from your sitemap, and disabling it from Google Analytics. All in One SEO Pack handles post titles and descriptions in a similar way to WordPress SEO. Social media settings can be added through the second tab. You can define the social media title, description, image, and image size. The width and height of the image can be defined. Social meta information relates to the way your posts and pages are displayed when someone shares one of your pages on a social media service. 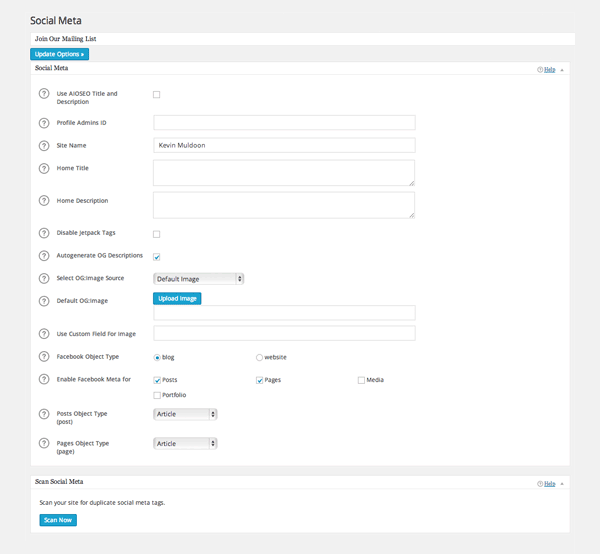 WordPress SEO has good social media integration options. 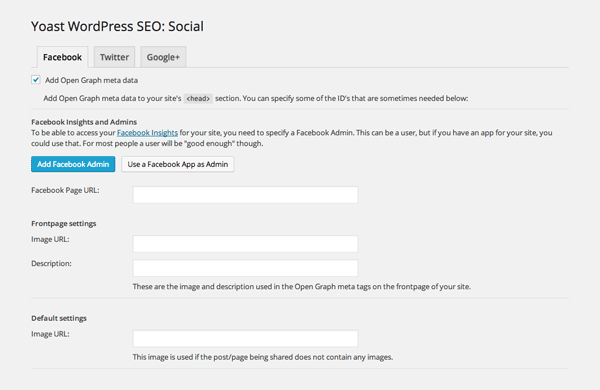 You can add Facebook Open Graph meta data, Twitter card meta data, and Google+ specific post meta data. All in One SEO Pack has Facebook Open Graph meta data too. In comparison to WordPress SEO, it offers more customisation options. This is good news if you want more control with how your posts and pages are shown on Facebook updates, though I believe most people would prefer the simpler way that WordPress SEO handles things. The plugin also has support for Google+, but the options for this are not displayed in the social meta page. Instead, they are located in the Google Settings area of the General Settings page. 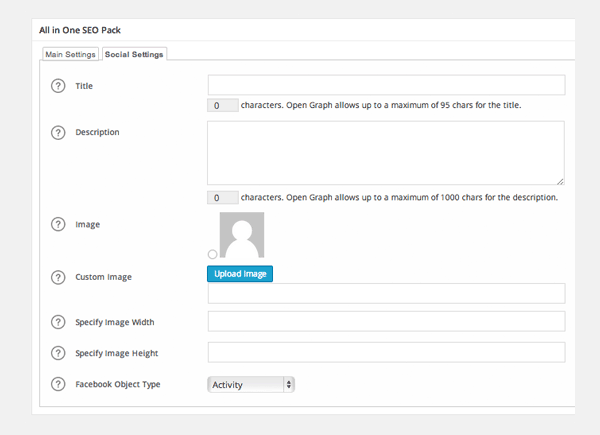 All in One SEO Pack offers more customisation options for Facebook Open Graph settings; however it does not currently have support for Twitter. WordPress plugins such as Google XML Sitemaps can be installed on your website in order to generate an XML sitemap and help search engines find your content more easily. This is not necessarily if you use WordPress SEO or All in One SEO Pack as they include an XML sitemap generator. 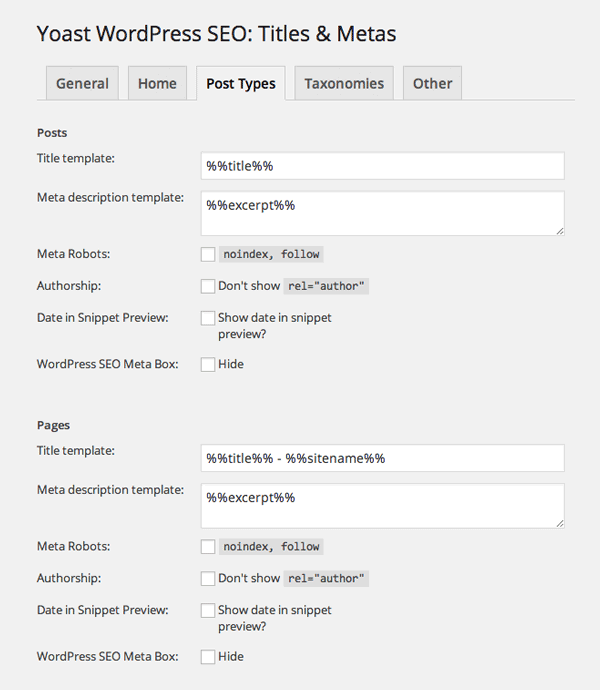 WordPress SEO allows you to exclude specific post types and taxonomies from your XML sitemap. 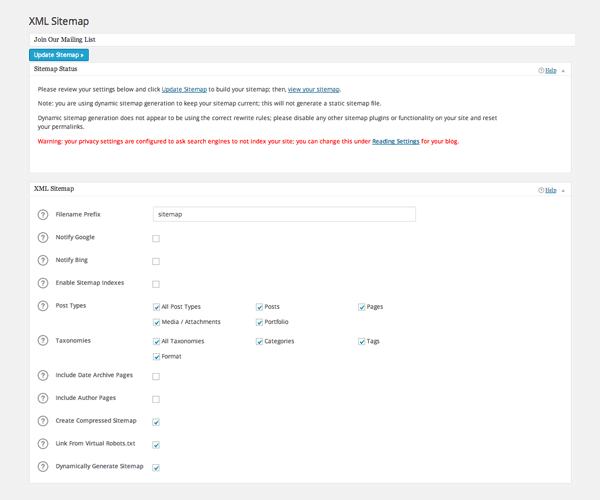 Additional sitemap options, such as priority, can be controlled via the SEO box underneath the post editor. 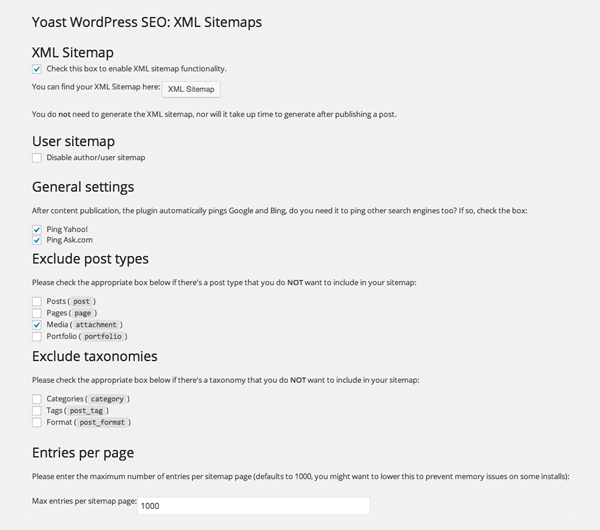 WordPress SEO can create an XML Sitemap for your website in seconds. Just like WordPress SEO, All in One SEO Pack can set up your XML sitemap instantly; however it offers a lot more settings for those of you who do want to customize your sitemap. In addition to excluding post types and taxonomies, All in One SEO Pack also allows you to include date archives and author pages. The filename of your sitemap can be changed too. All in One SEO Pack gives you more control over how your sitemap is created. Pages that were not created by WordPress can be manually added to your sitemap in All in One SEO Pack. All you have to do is specify the page URL, priority, and update frequency. The priority and update frequency of your home page, posts, and taxonomies, can also be adjusted. Categories can be excluded too. Important pages can be given a high priority. Permalinks – Miscellaneous permalink settings such as removing stop words from page slugs and removing the ?replytocom variables from URLs. Internal Links – Enables breadcrumbs on your website for better usability and improved on-site SEO. RSS – Place content before and after your posts in your RSS feed. Links are automatically added underneath posts to deter scrapers and help search engines detect your website as the original source. 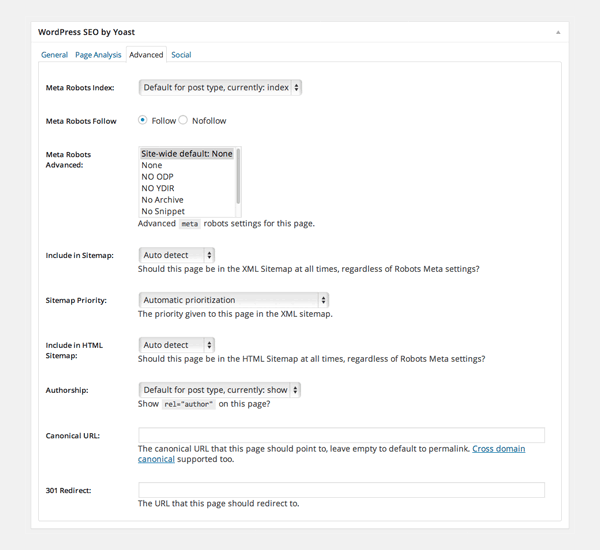 Import and Export – Export your WordPress SEO settings to another website. 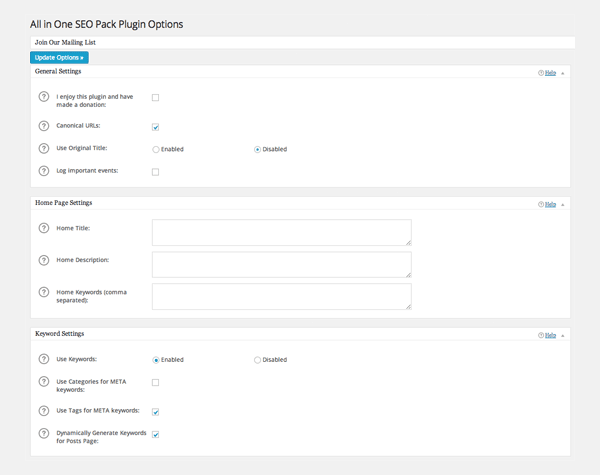 It also allows you to import settings from plugins such as All in One SEO Pack using SEO Data Transporter. Bulk Title Editor – Edit multiple post titles on one page. Bulk Description Editor – Edit multiple post descriptions on one page. File Editor – Edit your Robots.txt and .htaccess file directly through the admin area. 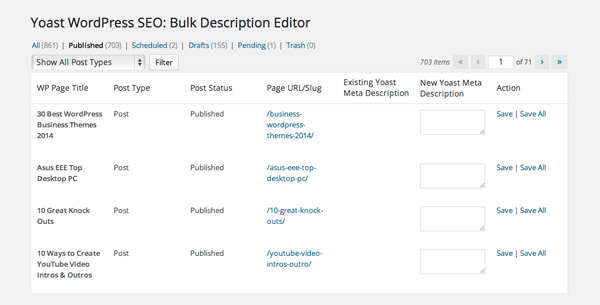 The bulk description editor is useful for going back and adding meta descriptions to old posts. Sadly, All in One SEO Pack does not currently offer any of the features noted above. However, what it does have is a performance page that lets you change the memory limit and execution time that is used by the plugin. The system status box on this page gives information about your server and a list of active plugins and inactive plugins. All in One SEO Pack gives you control over how the plugin is managed by your host. Premium options exist for both plugins. WordPress SEO Premium retails at $89 for a single website for a year. It costs $169 for up to five websites and $329 for up to twenty websites. 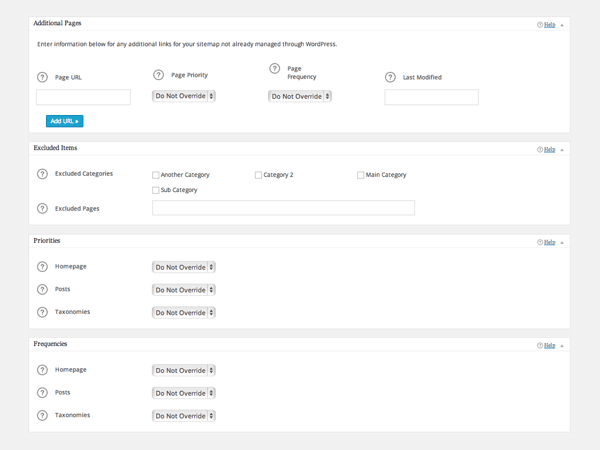 In addition to receiving premium support and upgrades for a year, WordPress SEO Premium features a redirection manager for redirecting old URLs. It also integrates with Google Webmaster Tools and allows crawl errors to be pulled to your website and then fixed immediately through the redirect manager. All in One SEO Pack Pro is more affordable. At the moment the premium plugin retails at $39 (though it normally sells for $79). Premium support is available for $49 per year. The premium version of All in One SEO Pack features a Robots.txt generator and validator, a file editor for editing Robots.txt and .htaccess, an import and export option, and much more. WordPress SEO vs All in One SEO Pack: Which is Best? Asking which of these plugins is best is a bit of a loaded question. The reality is that they are both capable plugins that will help you improve your search engine presence. Without doubt, the free version of WordPress SEO offers more options than the free version of All in One SEO Pack; but does this make it better? I personally use WordPress SEO on my websites, however I can see why others prefer the simpler approach that All in One SEO Pack adopts in many areas. That is why I recommend trying out both of these plugins and seeing which is best for you. With these two plugins its a sort of one or the other kind of thing. However, either should work just fine depending on your preference. The post I was waiting for. Yoast’s website and blog is an incredible source of information – and as such, I highly recommend his WordPress SEO plugin. Everything I know about SEO he hits the nail on the head with, and even addresses some things I didn’t know. In addition, he has a realllllly good article that is a “guide” on using his plugins and proper SEO for your site all together. I’m starting to incorporate his plugins into all of my websites, last one I have to do is my personal site above. Yes… but what about functionality? There is no doubt that the Yoast SEO is incredible… b u t…. I’ve got a handful of WP sites with WooCommerce running. The ONLY one that is crashing upon latest update to WooCommerce is the Yoast SEO Install. I always get nervous when installing such an huge & ‘invasive’ app into my WP sites… I end up spending hours trying to get everything going again. WordPress.org is kind of strange with everyone raving on and on and on and on about yoast. I can’t stand it. It’s buggy and doesn’t work and they can’t answer the basic questions. Yes, that is right.. as much as I like Yoast, as much trouble I had when I installed Woocommerce. – There is a certain incompability, which I guess is why the Yoast team sells their woocommerce solution and it is not free any more. I switched from Yoast to All In One SEO. Why? I had a huge site crash only when Yoast was enabled. I paid for premium support, and they tried to blame my hosting provider, and said they had never seen the problem, and then vanished for the entire weekend. I was left to rebuild the site, and then quickly switch to All in One SEO. They’ve been awesome, and their support guys are great. I don’t know of any video tutorials, however Yoast does have a good tutorial at https://yoast.com/articles/wordpress-seo/. These are the two SEO plugins that I started with, too… I’ve switched between the two.. and now currently using WordPress SEO and it seems to be doing just fine. Of course, could probably do more to make it better, but it’s a learning process! Yep, these seem to be the top two plugins. I used All in One before getting turned on to Yoast. We switched about a hundred of our WP sites over to Yoast. As you mentioned, one of the nicer features is the import of SEO items into Yoast from All in One. My clients (that are interested in doing their own SEO) love the color indicators and easy to understand advice. Of course, it is built mainly for Posts so you cannot always get clients to understand that you cannot do some things Yoast suggests with your Home page SEO tools like the Page URL when using a static home page. Overall my advice is to use Yoast. Just my humble opinion. Great article and subject! I can only admit to these facts…. Does anybody have experience with the woocommerce edition of yoast? Thanks for the post and this is something I have played with over the years. SEO plugins, these and others, are at best tricky in evaluating. What makes it worse is that google changes its algorithms all the time. So is it the plugin or changes in google with a little bit of luck? After being a webmaster of numerous sites and hundreds, if not thousands, of hours playing with these things the answer is, who knows? So when you say, “I recommend trying out both of these plugins and seeing which is best for you.” I can only say, this is not really much help — even though your efforts and explanation are appreciated, but there just is not a definitive answer other than: get links, have great content, learn basic SEO, work hard, and keep plugging (pun intended) away because you love what you’re doing. When I suggested testing both plugins, I meant testing them to see which interface you preferred and which you feel is easier to configure and use on a daily basis. Both of these plugins are set up to help you follow Google’s suggested guidelines (as well as those from other search engines). I am unsure as to how I can give you the definitive answer you are looking for. There isn’t a plugin that will give you instant traffic or give you an edge over the competition. If such a plugin existed, everyone would use it, which would remove any benefits the plugin would actually provide. Exactly my point. There cannot be a definitive answer. Not because of something you did or didn’t do but because there is no way to tell. Moreover, with millions and million of downloads for both of these plugins, and millions and millions of web sites all competing for page one on google make for a different questions, it is worth the trouble. I only clicked through to skim to the end to see if this was just link bait or if you were actually going to offer a real conclusion to a title like this. I’m not surprised to find it’s just another WordPress “best plugin” review. The ol’ linkbait and switch. Please, if you are going to ask a question and put it in your title or teaser, then answer that question for real or pick a different, answerable question. Plugin comparisons are useful, especially if you explain what each of the leading options for SEO (or whatever) are best at, and for what type of use cases. Pulling it altogether in a chart is always helpful too. Chris Lema has done flowcharts, for example, showing how to select a plugin solution based on your particular needs. You’ll get and hold more readers with that approach. The title was not intended as link bait. I did consider something simpler such as “A look at WordPress SEO and All in One SEO Pack”; however I wrote the article in a way in which I compared each major section. I honestly don’t believe there is enough between the plugins to declare one a winner over the other. Certainly, no one has ever performed a major case study between the two to illustrate whether one plugin increases search engine rankings more than the other. And such a case study is rarely conclusive as there are so many other factors that have to be taken into consideration when doing such a test. I pointed out all the major differences between the plugins. As a WordPress user myself, that is what I am looking for when I am l swaying between two plugins. I am not disputing that flowcharts may help some people, though it is not something I personally look for. If you have been reading Elegant Themes over the last few months, you will know that I do not use the ol’ linkbait and switch. The vast majority of my article titles are boring and to the point. Very good post, in comparison wordpress SEO is useful and has a way of knowing that you are doing the work of otimización the right way, which other plugin do not. I was using Ultimate SEO, which is a bit more complex, I guess it is much more advanced, I would like an opinion about this plugin, HOWEVER I was pleased with what I read in this post, thank you people of Elegant Themes for such a profesional team, thank you Kevin Muldoon. Thanks Edwin. I have never tested that plugin before. Is it on WordPress.org? I have to agree with Dan. I thought the Elegant Themes came with built in SEO features in the ePanel. They do, as stated in the beginning of the article. However, we have also made sure that our themes are compatible with these two plugins, due to their popularity. You can chose whichever method works best for you. I started with All in One Seo Pack however, your deep contrast and clarification will enable me to try out WP Seo. Thanks for this delicious post Kevin. I too have tried both plugins, and I prefer Yoast. I recently upgraded to the paid version and I am having excellent results. My website dominates local search results, when just a few months ago I struggled to get on the first page. I have never used the premium version myself. Did you see better results after upgrading? I purchased their video SEO add on last year and it was very buggy. nice article, thank you very much! Reg: “Sadly, All in One SEO Pack does not currently offer any of the features noted above”. I responded to Dan above about that. I used the word versus in the title as it was a direct comparison between the major features of the plugin. However, I do not believe one plugin is better than the other. WordPress SEO offers more features in the free version, yet All in One SEO Pack has twice as many downloads on WordPress.org; which illustrates how popular it is. If you want a conclusive answer, I would say WordPress SEO. That is what I use on my own websites so if I had to choose, that would be the one I would use. Though you need to bear in mind that I have always used that plugin. If I had started using All in One SEO Pack from the start, I might be using that plugin on my websites. Seriously, when you compare these plugins, which I did in the above review, there is not a lot between them when you compare essential SEO functionality. Thanks for the unbiased review. I’ve been using All-in-One and found it easy to use and understand. My pages on my review site ranked fast and many on page one. I tried Yoast a while back and was a little confused after using AIO… but just installed the new Yoast SEO on a new website and found it intuitive. Yoast seems to offer more help and tips through website and email. In conclusion, your conclusion was on the money. 🙂 Both are good, both come at things a little differently. For me, right now, it is probably 52% AIO 48% WPSEO… but that could change the more I use WPSEO. Thanks for tackling this topic! haha I think a few people disagree with your opinion that I was right on the money. Some readers want me to declare an outright winner – but I do not believe one exists. I have never used All in One SEO Pack extensively myself, other than testing it for reviews etc. I was actually surprised by how similar these plugins handle things when I compared them. Awesome article Kevin. So do we use the SEO functions in ePanel or are these now redundant if you use one of these plugins? ePanel offers many great SEO configuration options. Elegant Themes has been designed so that users can decide which SEO solution is best for them. So if you prefer the look of WordPress SEO or All in One SEO Pack, you can easily switch to them. If not, you can continue using ePanel. Using the theme NIMBLE, I see no option on SEO for WordPress to set the title and description of the home page, but for pages, however when I use the version of SEO built into the ePanel theme, which the choice is clear,its more easy , my question is.. If is possible to use the “SEO wordpress” plugin and integrated SEO option on the theme both? You have to choose one or the other. If these plugins are enabled, then their settings will replace the default ones that come with the theme. We have started using WordPress SEOUL and it has worked wonders. The info on his site has been brilliant also, with links to other helpful blogs and topics regarding SEO tips. We plan to take a look at all in one also to see which is easier to use out of the two and which produces the best results. Thank you for writing this blog it has been very help in understanding the difference in the two plugins. Chosen for me SEO by Yoast, like it’s search preview description while editing posts / pages. One more “+” is dynamic sitemap generation with attachments count and links, and breadcrumbs integrated, so you can save your memory without need to instal more plugins and make blog faster a bit. Great post, appreciate the comparison of the two SEO packs (despite the negative comments about not answering questions above!). I found it really useful. I love both plugins and it depends on what you want to use them for, I use Yoast’s WordPress S.E.O. for a small e-Commence site where it does help with S.E.O. I use all in One S.E.O. for a much larger site, and it is more difficult to use a unique description and Title for every page, so I think that the choice is yours, but they are both good plugins. Q1. Anyone have any thoughts on how much Yoast adds load time? Did anyone notice a difference once installed and activated? Q2. I’m currently working with the SEO tool in ePanel to get it set up. If I’m willing to put the work in there, is there a compelling reason to switch to Yoast instead? Wow. I had never heard of that before. Sounds like the plugin is clashing with another function somewhere. This is the post I have been waiting for. Going to try WordPress SEO (Yoast) out on a site I’m working on here tonight. Thanks for a superbly written article Kevin! A great article. It was very helpful and clarified many things that was necessary for us to make our decision. Glad you liked it Tim. None of them, It’s Yoast! Yoast is one of the two plugins we review in this article. Nice comparison and review. Not sure but I was told by my hosting company (hostgator) that Yoast’s plugin is a resource hogger!! In fact, I was forced to remove that plugin from one of my websites hosted with them. I did that. Can you please confirm this? Other than that, I love using WordPress SEO Plugin which offers so many options. But I think they must improve their xml sitemap which would be great if it’s at par with the Google XML Sitemap. It is not something I have personally experienced, though by the same token, it is not something I have paid attention to because no problems have been raised. I would have to do a direct comparison between them by checking the speed of my website with each of them activated. Though that would only show any small differences on a live website – which will probably be minimal with plugins like this. Hostgator are probably referring to the additional CPU load and memory usage that some plugins use. I’d have to check my server stats for that over, say, a few days or a week. What I will say is that shared hosting companies such as HostGator are notorious for telling users to disable plugins that put even the slightest increases on load. There are many top websites that use both of these plugins, so I don’t believe it is a major concern (especially as I have never read about this). Have Hostgator provided you with server reports to back up their claim that Yoast’s plugin is a resource hog? The problem with shared hosting packages is that they give you so little CPU and memory. The whole business model is based on small websites that do not use any resources, so they tend to be very tough on anyone who uses a plugin or script that does use a little CPU time. I imagine the plugin does use more CPU time when it is doing things such as generating sitemaps. 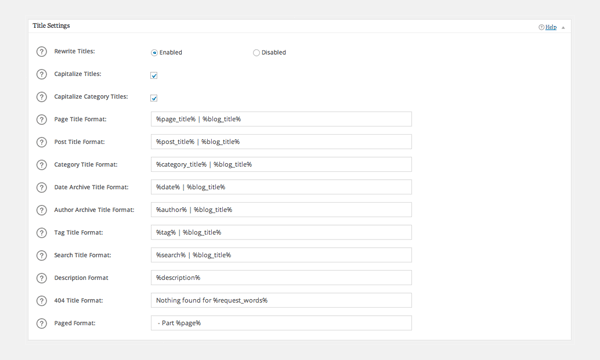 Have you tried disabling the sitemap functionality and other additional features? Oh yes! I forgot to mention, yeah I did disable the sitemap and then since then all seemed to work. I did not disable the sitemap part as they told me. I just switched to a better looking Google XML sitemap. I did not even think of this. But yeah, now you are telling me and I remember I hate to use the xml sitemap created by Yoast’s plugin and this might help me using the plugin without any fuss from those Hosting companies. It sounds like that could have been the cause. Glad everything is working well now. SEO – a tolerable topic. But good that there are these plugins – they facilitate it so much. and second (which is what I really want to ask! ), will ET create a nice one-page theme someday? (for us who know nothing about coding). I don’t see any reason why the plugins would handle one page websites any differently to multi-page websites. well, I’ve been told one page sites have poorer SEO positioning due to the lack of pages/links. I’ve been told also , Google is working in giving more importance to the #id so one page sites don’t suffer discrimination…. but I’m a total newbie in this. My background is audiovisual production. Fine article, without killing one of the plugin in the end. And the conclusion that each user needs to try the plugins to see which fits the best, i agree. Glad you found it useful Morten. Great post! I just took on a client that had some shady people working on their WordPress backend and had a bunch of random and duplicate plugins stuck in there. I tended to just default to WordPress SEO, but then I realized I had no idea why I was! This was a great informative post and it will help me to better serve my clients! Thank you!! We’ve been using WordPress SEO for all our clients’ websites for years and I too have recently questioned whether All-In-One SEO Pack would be a better choice. This article has really helped, so thanks very much! It sounds like they’re both valid choices. Personally, I find WordPress SEO’s traffic light system (in which it gives each page/post a red, ambed or green rating based on how well you have ranked for your main keyword) pretty handy. It’s a fairly crude tool as SEO is about much more than how many times a specific keyword is mentioned – particularly given recent SEO changes such as Google’s increasing acceptance of keyword variations. However I still find it a useful guide which I’d be disappointed to lose if I switched to All-In-One SEO Pack. Which is the best SEO plugin? google ‘wordpress seo’ and the result is already pretty clear rite? I discovered first the All-In-One SEO pack, but currently using WordPress SEO. They’re both great, but I like Yoast so I prefer his plugin. 😛 Have you tried comparing their performance hit on your server? The recent major update of WordPress SEO is about performance. I’m very interested to know which one is better in terms of resources usage. You can see a difference in your website page loading time by doing a speed test with each plugin activated, however I am not sure how they affect your performance speed. I imagine it will use up a little resources when generating a sitemap. Thanks Kevin for best information about SEO Pack…. I’ve used both and ended up settling on All in One SEO after using P3 (performance) plugin to see which of my 20+ plugins were a resource hog. Turns out that WordPress SEO, which I really liked, used up almost as many resources as all of the rest of the plugins put together. I’m now using All in One SEO. Gtmextrix.com had my site at 6.5 seconds before changing and 2.2 seconds after – I also made a couple of other minor changes which helped, so my story remains apocryphal, but I believe most of that improvement was due to the seo plugin switch. I am not sure if WordPress SEO is the cause. I would certainly believe that All in One SEO is the lighter plugin of the two, as it offers less options (though I have not tested this myself). I have not seen anything to suggest the added response times that you have experienced. My personal blog uses WordPress SEO and my page loads in 0.59 seconds. I analyzed http://stylenews.us/ via GTmetrix and the biggest issues it says you need to address is to optimize images, specify image dimensions, and combine images using CSS Sprites. Well i have also used both of them but i cant make a difference between it. Both of them are great and best. But currently i am using wordpress yoast. i am using both and in my opinion, i prefer using seo plugin from yoast because there are simple menu and we can look directly below the post box. Nice post, Kevin. I still prefer All in One SEO for its simplicity. WordPress SEO and all in one seo pack are the best SEO plugins for WordPress. Some of my site were development under WordPress CMS, I have used both. 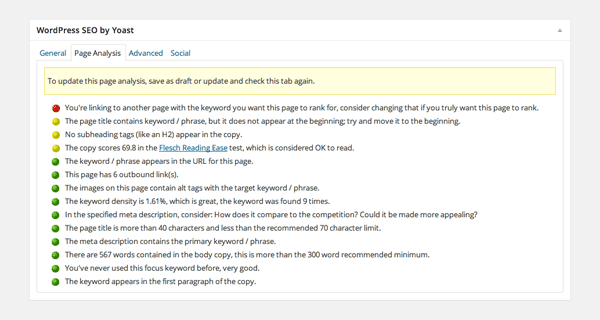 What I do not like about WordPress SEO is that they do not care much about Keywords, for my it is still important. All In One SEO Pack is great for my needs! Thank you so much for this article Kevin. I am currently weighing out which one I’m going to use for my site and future clients. I think at this point Yoast is winning me over with a few features. Thanks again, look forward to reading more of your posts. Thanks so much for this article! I have a question…I’ve been using All in One SEO for 4 years…if I switch to WordPress SEO, do I lose all of my keywords, meta, and other settings that I’ve set for each post/page? Or, does it migrate over automatically? Yes. First you need to this plugin, https://wordpress.org/plugins/seo-data-transporter/, to export your settings etc. Then, Under the Import and Export section of WordPress SEO, look for an option entitled “Import from All-In-One”. Yes Kevin.You are right.I m also using WS Yoast and i am comfortable. Originally I was using All in one SEO pack, but then later on I changed to WordPress SEO. I feel that Yoast has created a fantastic plugin and it better suits my needs as I get more particular about how I do on-page SEO. ah….i was using WordPress seo,but when i faced problem…yoast didn;t helped…asked for premium service..
how can a unknown person,go for premium while i believe my issue is not so big..i just changed to all in one seo,after searching a lot. WOw, what a very useful tips and sharing I get here, thank you so much for sharing this.. I had to do plenty of reading to set it up and got a few 404s with the XML sitemab but eventually got it all sorted. Time to sit back and watch for the effects. Hope it works out well Keith. Will be interesting to see whether you get more traffic by switching. What did you do to resolve the 404 errors on the sitemap xml files? Too many people are stick in SEO, I think that a good website is not only SEO but also other factors like good unique content, age of domain, backlinks, the subject of a website and post. The SEO plugins are a part of having a good website. Google is changing their way to rank all the time. First it was backlinks, now it is speed. I use both seo plugins, no both on the same website but for smaller websites I use All in One SEO and the others Yoast. I will also advise you to give it some time before your see the results. It is also depending on your theme what plugins works for you. There are so many factors to rank or have a great website, and SEO is a little part of it. I use All In One SEO Pack and it works like a charm. I’m in a spot, and I need help. I have recently transferred my blog from Elegant Themes’ Aggregate to Genesis’ Education. Unfortunately, all the SEO data I had in Aggregate are lost in the new theme. I installed the plugin SEO Data Transporter by Nathan Rice, but again unfortunately the Elegant Themes is not listed included there. I appeal to Nick Roach or anyone in Elegant Themes to suggest how I can retrieve the SEO data since it is affecting my site. Testing a lot of SEO Plugins over the years, I’m running wpSEO by Sergej Müller on all WordPress websites (except, the customer wants this or that). AIO SEO Pack -> great to start with. Yoast -> lot of functionality but a little bit bloated and for the common user difficult to use. wpSEO fits that gap with a intuitive options board. In the end, it doesn’t matter on which plugin you rely. Customers always complaining about their google ranking though they installed wordpress seo! There is a total lack of understanding that plugins are only a part of a strategy. yaa, i am also going to use both of them.. thank you for suggestions. Great tips! I had been using WordPress for quite a while now and love doing SEO. The SEO plugins make it much easier to manage the content, images and Meta tags. I’d be curious as to what you thought of the ultimate plugin Kevin? since it’s free and feature rich. I was a fan of All in one SEO, but after this article I will surely try Yoast SEO. Thanks for sharing such a good article. Thank You. You made me able to choose best plugin of both..
but which i can use ? About the Google webmaster reported errors, I was considered maybe is just something I been wrong with the design, and was not questioning the plugin, but I was not aware of the premium functionality which allows to fix such issues… I’m now wondering if the All in One SEO Pack users out there are seeing similar errors in the Google webmaster tools as what I’m seeing as a WordPress SEO user… the ultimate test would be to create 2 identical sites and optimize each of them using each of the separate plugins and then compare the data over a period of time to see which site/pages/posts would ran better and would report less errors. Amazing article! Thanks for the insight. There is also a new SEO/User Engagement WP plugin being released tomorrow by a company called infocc. I know that if you agree to blog about their plugin you can try the full version for free. They also have a free trial of the lighter version available. Couple comments above shows the exact post by different users. I used All-in-One but now I use Yoast SEO. But i have a huge question here. Wich of both is better performing a Website where Images are only in there. Kevin, thanks for a very thorough review of the two SEO products. I’ve used them both over the years. You are being very kind to All In One SEO … as far as my experience goes, WordPress SEO has overtaken AIOSEO and made a very complete free product. I have not yet subscribed to the PRO version yet, but have found the free version very successful for my web site as well as my clients’. Thank you again. Superb article… Please sir kindly guide me about complete settings of WordPress SEO by Yoast. I’m completely unaware of this plugin because I’m new Wordress user. Myself stick with Yoast wordpress seo plugin. This awesome plugin is working great for me and deliver incredible result to my website. Anyone loves this plug-in, please stay with me…. I wanted to chime in here with the following, just this last week we had the following issues with the premium WordPress SEO plug from Yoast. $89 for a single site. We purchased that to start with in the mindset of thorough testing before investing in the developers package. 1. saving of settings on the multisite settings page not working. 2. restoring site to default settings from multisite settings page not working. Jul 23 21:56 We sent to premium support WITH the licence key as verification, so far so good, here is where the fun starts and the disappointment, here is what happened next. “Unfortunately our support system has been unable to verify your license. “Sorry, I completely missed that! Completely my mistake. Can you give me admin details of your website so I can have a look/investigate it myself? It actually looks like a bug in our plugin. I’ve tried on our own test site, and while that one is saving, it’s completely different from the free WordPress SEO plugin, where all the fields in the SEO section of our plugin on multisite are dropdown, instead of just the top one. So we think it’s probably breaking somewhere around the second field. I’ve created a bugreport and we’ll get to work on this and fix it asap! Ok, never mind, it can happen, now we have them logged in and we have premium support and a 30 day money back guarantee, guess they will fix it now, we have only had the plugin for 9 days or so, no problem, now they are finally on it, we can forgive them for not even reading our initial support ticket right? “How long?. What is asap? we have data in our data base but obviously all our pages and posts now have no snippets as this has also caused an issue with import, data is there but we can not get all our snippets done until this is resolved. let is know where & we will fix it ourselves, right now. “I’m afraid that all of our developers are on holiday at the moment, so it can take quite a bit longer than just over the weekend. They will be back in 2-3 weeks. Do you need the premium version for other features or just for support? If just for support, maybe you can try that one and see if it works. We were, “Flabbergasted” This is premium support? As you can imagine, they suggest we dump the plugin we of course purchased for the extra features, duuuuhhh, and replace with the free one we absolutely do not want while they are on holiday. Arrogant clowns..
b. Would have run us over our 30 day money back guarantee, eeehm don’t think so ladie…. I can imagine your surprise. You might find it hard to believe that we are actually small company. I’m sorry this is cause for such a dismay from your side. Non deliverability/no support/in writing from you. Take care with this bunch, not all marketing and pretty cartoons a good plugin and or company make. I just wanted to share my experience with these 2 plugins. If your website environment is like= WordPress Multisite + bbpress + Buddypress then I suggest you to use All in one SEO pack. I tested both and WordPress SEO is still buggy while All in one SEO plugin handles your site very clean. I suppose plugins slow down loading speed for websites. Would either of the above cause a significant problem on shared hosting? Which would be more preferable in that regard? 1 vote for WordPress SEO by Yoast. thank you so much for your post. I tried all in one seo in all of my websites. I plan to try yoast next time with my new websites. Thank you so much for info. Thank you for this. I was never sure which one was best to use and this is really helpful. I always heard Yoast was the best but I longed for something simpler. Good article. BUT one thing is a FACT. The WPSEO bt Yoast not working in MULTISITE. There are a lot of problems like empty fiels and strange links. I recently lost a lot of content due to the botched update on Yoast. In the past was a good option maybe the best, but today is bad plugin with terrible curses. Thanks for the information, it was great and I was happy to give Yoast a go, but there seems to be a lot of recent negative feedback, what are your thoughts? Is it stable, fixed, or still experiencing these issues? Can I download an older version of the plugin? Lastly.. if I install Yoast, can I still keep the site a secret as I want to launch it when the SEO and content is complete. A bit worried if I install the plugin all of a sudden my site will be live and showing up in Google. Kevin, I’ve been using all in one for four years but recently tried Yoast on a site for which I freelance. I loved that Yoast gives you directions on how to make the post more seo friendly. I’d like to migrate to Yoast, but I have almost 500 posts on my site and don’t want to have to customize each post. You are sharing helpful post. And i am also use WordPress SEO plugin for my blog and this is working properly. But if anybody who want to grow their blog for short time or in short time so they need to have All In One SEO Pack plugin. AIOSP plugin gives instant ranking but WordPress SEO makes your post fully optimized for Search Engines. Kevin, you have described the concepts of both very well. I was looking for something similar where I can see the pros and cons of both plugins. It was not only the article itself helpful but comments provided by experts are also very informative. Thanks for sharing I gone through it and enjoyed. What features that AIO SEO / WORDPRESS SEO / YOAST plugins include, the ePanel builtin SEO doesn’t? this is really helpfull, I’m have been using those both plugin, and I’m using AIO SEO right now and I like it, but I’m miss Yoast under box post feature…. Previously I used AIO SEO Pro, but now I decided to use Yoast because in my opinion, features of yoast more complete. although I must learn to settings again from the beginning. Both plugin above is great and have advantages and disadvantages of each. Yesterday, I did my own side by side comparison of these 2 plugins and for my purposes, I am leaning heavily towards the WordPress SEO, as it gives me more usable feedback to better my SEO. Although, I have noticed it does miss some items. For instance, it tells me ”	The keyword doesn’t appear in the first paragraph of the copy, make sure the topic is clear immediately” when if fact my keyword is in the first sentence of the first paragraph. For whatever reasons, the plugin is not seeing the keyword in the first paragraph. Not sure what to think of this. Has anyone else seen similar behavior? @Kevin do you by any chance have the best and recommended options for WordPress Seo by Yoast? Hi Kevin, great post. I am currently using all in one SEO but was wondering can you use both at the same or is this not good practice? I’ve just started using SEO by Yoast in some of my wordpress websites, but honestly i’m not sure yet if i should use it in my best website, cause i’ve seen lots of bad reviews about it. Thanks for posting this! I just started my own blog and this page was super helpful. I do have a question and I am unsure where to turn at this point so I thought I might try asking you as this page was my original introduction to the concept of SEO plugins. I have been using the free WordPress SEO plugin – I was comfortable with it and thought it was working great but then I realized that none of my titles or meta descriptions actually show on Google. Google doesn’t even show any specific post titles for my content, just my website title each time and an excerpt from the post with the given word I’ve searched. It really doesn’t look very appealing to click on. I got in contact with the WordPress SEO guys but they said they couldn’t help me because I have a free version of the plugin. I guess, more than anything, I’m wondering if I purchase this plugin does that guarantee it working? I know there is support and all that, I’m simply confused as to why it would just absolutely not work at all. I’m really new to all of this as you might be able to tell, so any insight you might have I would sincerely appreciate. I use wordpress seo (Yoast) in one of my site and I use All In One seo pack in a funny image sharing site. It worked for me in the funny site for long time but it is not working for me now. Search impression and clicks has dropped about 40%. Which one should be used in a image sharing or wallpaper based site? Thanks for the detailed comparison. Like many people here, I was looking for a definitive answer about which SEO plugin to use, but it doesn’t seem that clear cut. I use WordPress SEO on number of websites, and it has some great functionality, but I always feel a bit overwhelmed by it. I’m not sure why, because it’s fairly intuitive and the help and tips that come with it are really good. I think the problem I have is that it does so much and makes me feel like I’m out of my depth. For this reason I decided to have a go with All In One SEO Pack, and although it doesn’t have the nice user interface of WordPress SEO, I think I’m starting to prefer it because I feel more in control. I find this really strange because WordPress SEO is recommended highly, and the graphics and traffic light system mentioned above are very reassuring, but it does feel like it’s too big for me. Another thing that’s mentioned here is that WordPress SEO has been linked with slow website loading. I have noticed that a number of my websites were loading slowly and I assumed it was the host’s fault, but they all had WordPress SEO installed. I take the point about shared hosting providing the fewest resources possible, and this is another reason why I might persevere with All In One SEO Pack. Thanks again for the great post and to everyone here for the interesting discussion. It’s an impressive comparison. Thanks for sharing. You resume very good the difference features and ergonomy of the two but I think you miss an important part of any plugin in WordPress (or any website): technical stuffs. Of what I read, AIO is much lighter than WordPress by Yoast. For the moment. Nice guideline, very detailed, that very helpfull to someone who still confused between these 2 plugin.. for me personally, i have use that 2 plugin at the moment.. I recomend all in SEO because its more simple than wordpress seo, but it lack some additional feature ..i recommend wordpress seo because its give me more detailed on how SEO Work on our post/page, i really enjoy the light (RED, Yellow, Green) That indicate how we create a content for SEO.. I want to shift to WordPress SEO from All in one SEO pack. Will it effect my current search engine result? I’ve already asked this question, but there was no reply from your side. Thanks for the comparison blog review. I have always used Yoast WordPress SEO but recently decided to search for another option to run my sites. After reading this I think I will stay put with Yoast. The All in One SEO doesn’t seem to fit my needs in a way that would benefit me. Thanks for the information Sir, but I prefer to use All in one SEO Pack.. although both is nice plugin..
Hi, Kevin MuldoonThank you very much for the comparison. I am newbie on WordPress & still learning on blogging. Your’s post really helpful. Kavin can you please suggest me that what might be the good seo plugin for a wallpaper site? I have been using yoast in my other site and getting decent results. Great article, I use All in one one most my websites, however one thing that interests me is that when you type in things like “wordpress seo” or “seo on wordpress” look who dominates the top results. This doesn’t necessarily mean Yoast is better but it certainly shows they know SEO. Hi, currently I am using the Divi page builder with wordpress SEO by Yoast. Unfortunately the SEO page analysis doesn’t seem to work with the page builder. Does anyone know a way on how to solve this as I find the page builder a very useful plugin? Where has this article been all my IM life 🙂 thank you Kevin for such an in depth comparison. I always get asked what the difference is and frankly speaking I didn’t have a clue what it was as I only use The yoast plug in and I was too busy to research the All in one SEO one. You have saved my rep. being noobie I need to get my website loading faster and I have no clue how to optimize my images they seem to be the culprits. Cheers and Happy new year. I use Infinite SEO that is a premium plugin from WPMU DEV that is good for multisites…But there are some things that I don’t like from him. So I recomand the Yoast SEO plugin for everyone! According to me WordPress SEO Plugin best. Now i’m no need other plugin for onpage seo and google sitemaps. Switch over to WordPress SEO from All In One Seo because of the resources consumption. Great information here. I decided to go with the Yoast SEO plugin. WordPress SEO from Yoast is still my go to plugin for generic SEO. Great tool to get a site up quickly. The traffic lights are a bit misleading at times, and do not work with custom page builders etc… but give clients a good foundation going forward. Less of a resource hog too. SEO by Yoast is the best one. All in one seo and SEO power suits are still in race. I think Yoast SEO is better, BUT it should leave the XML sitemaps to other plugins like Google XML Sitemaps by Arne Brachold. I have used Google XML Sitemaps by Arne Brachold for years before Yoast even came along, and it works great. Now, I see Yoast trying to steal market share of this niche by trying to add this Sitemap function into his plugin, but you can’t do everything, and clearly he can’t do everything. Especially not for the free version with ZERO support from Yoast. He should just fix the error message that constantly pops up telling me that Google XML sitemaps plugin will conflict with HIS plugin. That message stays no matter how I set the Yoast plugin. WordPress SEO from Yoast continues to be my move to plugin for generic SEO. useful gizmo to induce a website up quickly. The traffic lights area unit somewhat deceptive occasionally, and don’t work with custom page builders etc… however provide purchasers an honest foundation going forward. Less of a resource hog too. Thanks for the great post. I think WordPress SEO is the clear winner here. All in one SEO plugin is best in all but my SEO teacher says that Easy WordPress Plugin is also very effective and he also said that you can install both plugins and use at same time. Both are free plz suggest that which one is best for wordpress site and blog. Is the All-in-One-SEO pack appropriate for websites not just blogs? I am currently using all in one SEO but was wondering can you use both at the same or is this not good practice? this analysis lacks in some performance aspects. Initially i had used All in one seo, but now i decided to change it to WordPress SEO by Yoast. I have this exact problem about “specify image dimension” on the homepage http://www.artiane.com and I have difficulties to find any precise and easy way to solve it. Thanks for your help and your post! how about resource cpu, which plugin using many resource cpu? thanks. Thanks for your big analysis post. I’m also using WordPress Yoast. But I see there have some extra meta feature like schema added in All in SEO pack. That’s why i’m little bit interested about All in SEO Plugis. But i need to transfer all seo data from yoast to all in seo plugins. Is there any easy way to do that??? I used All in One SEO for years, recently I tried WordPress by Yoast. I do enjoy each of the functionalities, yet I’m going back to All in One as I feel that WordPress by Yoast changed my ranking for the worst. Hi kevin, nice article and review And fully helpull. Just info i’m using wordpress seo premium by yoast. I use Yoast and really like it, but the comparisons and comments make me question if I should try using the other SEO plugin on a second niche site to see how it will work with the rankings. Great comparison and post. Thanks for taking time to put such a comprehensive and informed post together! I am Using All in One Seo Plugin . Great Plugin. Works Fine . Great Post….Thanks For Sharing With Us. I’m actually only using the Yoast SEO package as of now. I have all in one currently in use but have come across a number of positive reports on Yoast lately, I would like to try Yoast but hesitate because I don’t know what effect it will have on my current installation. Any thoughts would be welcome. I was Yoast lover for last few of years and I started using All in One SEO two months ago when I found Yoast plugin conflicting with one my theme, may be update issue. Anyhow, I didn’t see a big difference between Yoast and All in one SEO from Search Engine Optimization perspective. Both do a great SEO in my opinion. Yoast is a mess with the current Divi. If you’re using Divi as your theme, don’t use Yoast. Unless you want a lot of Divi code showing where your SEO terms should be. site. Is there a way or what are the settings so the new plugin AUTOMATICALLY picks up all the old post and gives them Title, Description and Keyword values on your ALL POST page. Right now all I am getting in the area of the the above 3 items is No Title, No Description and No Keywords or do you have to do each post manually. I know manually is preferred but for now is there a way for the program to do it automatically? Yoast SEO used to be our go-to plugin for all things SEO. But their consistently sub-par coding practices have driven us to look for an alternate. Maybe AIO SEO Pack, maybe something called Delucks. Not sure. But Yoast has imploded. Bad news. And well-deserved criticism. Such potential. Wasted. i have so many site i am using both i am satisfy with all in one seo plugin. i think this is easy and have best feature help in good on page seo. I preffer WordPress SEO by Yoast. I think the WordPress SEO plugins are not useful, because according to Google New Update, now the Google takes Description from anywhere of your content, So now Meta Description don’t have great roll for Ranking Factor. Everything I new is Yoast is number one. But my reason for using All In One for my website marketing is it supports Multiple keywords. We need to buy Pro for Yoast to work for multiple keywords, but that is also limited to few keywords. What do you think? I am currently using Yoast SEO for most of my website. I have used both and clients do like the shiny red light green light indicator, but I have found that the All In One SEO Pack updates more often and support is better. Kevin, much obliged for an extremely exhaustive audit of the two SEO items. I’ve utilized them both throughout the years.